A wonderful place to find treasures! What a lucky break in the weather! After a week of rainy days, we woke up early on Saturday morning to delightfully dry weather. All week we had been looking forward to a relaxing day in the country. We were on a treasure hunt and my husband and I each had one small thing on our ‘wish lists’ for the day. Oldies on the radio, sunshine, and blue skies made the hour-long drive fly by. By 8 o’clock, we arrived in the small, friendly town of Morris, Illinois. This pretty park sits along the peaceful, historic waterway. 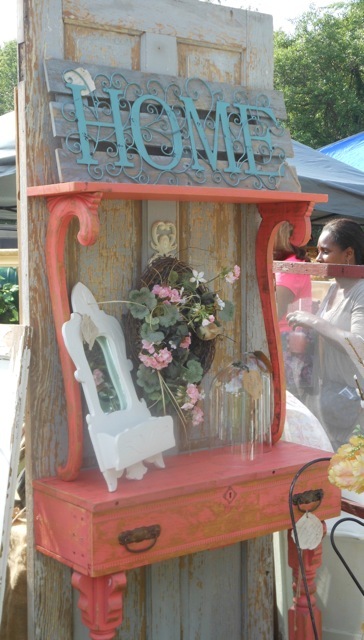 It was time for the 3 French Hens French Country Market. 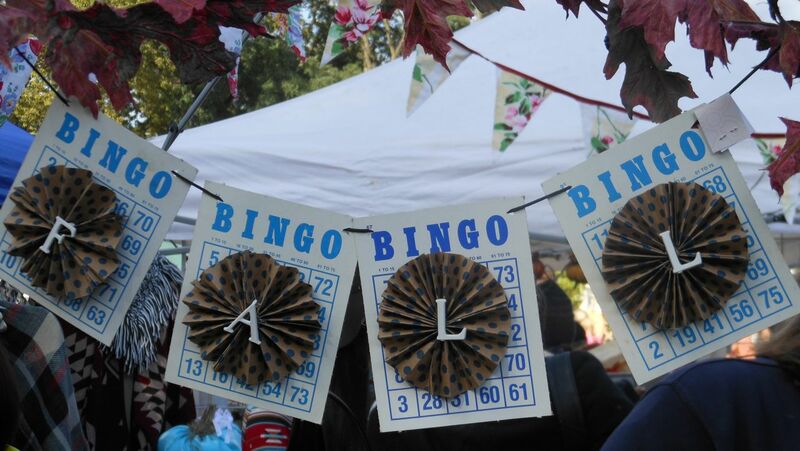 This popular event is held on the second Saturday of each month, from May through October, in Canalport Park along the banks of the historic I & M Canal. 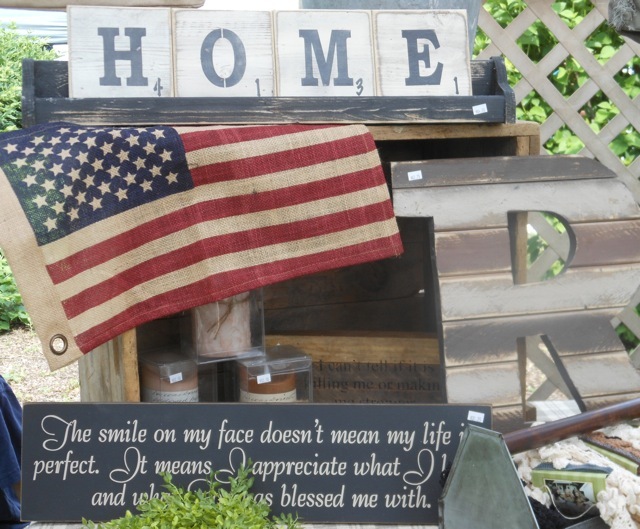 It’s always one of our favorite antiquing destinations! 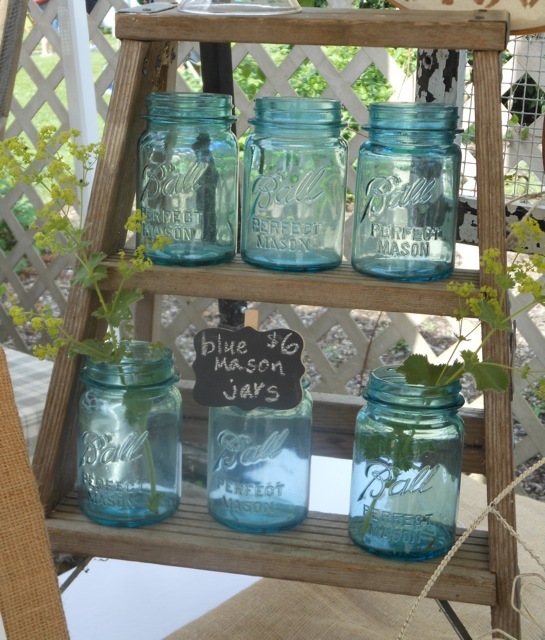 Vintage Ball jars line the stairs of an old step stool. 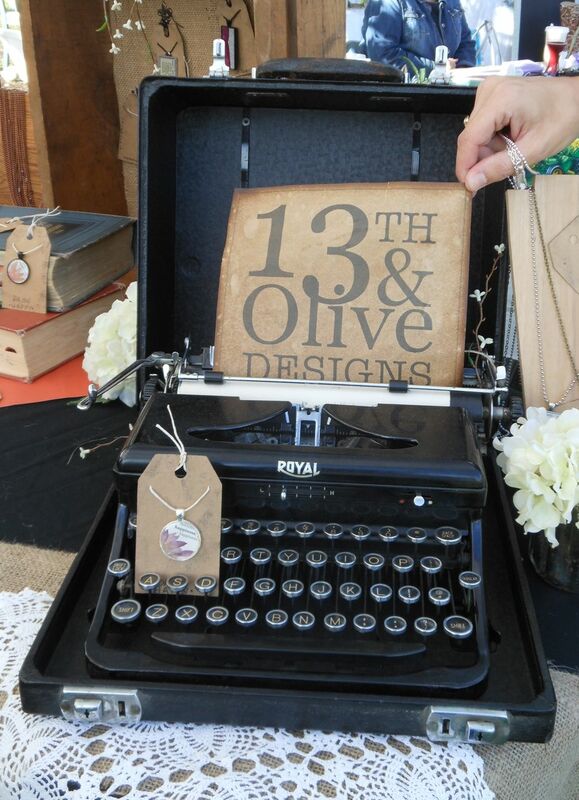 Saturday’s market was bustling with happy shoppers and friendly vendors when we arrived for the 8 o’clock opening. 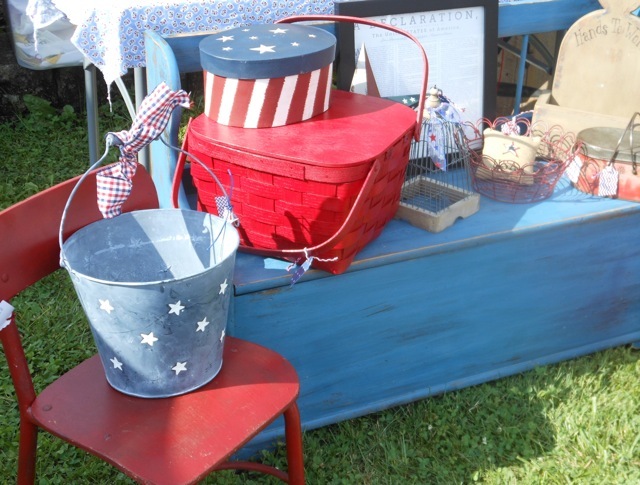 There were 143 booths filled with antiques, vintage treasures, flower-filled baskets, farm fresh vegetables, artwork, and repurposed one-of-a-kind items. An unusual upcycled bench caught my eye at one booth. 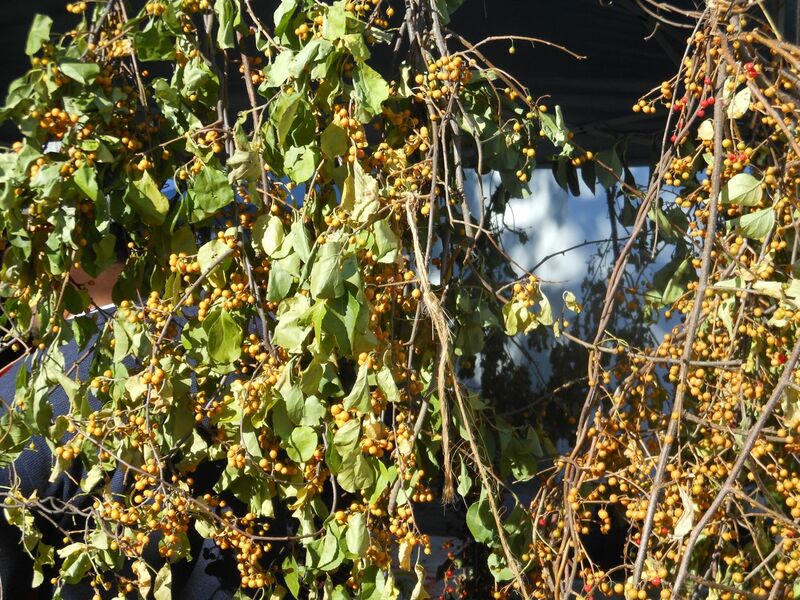 There were several growers selling flowering plants. Of course, I couldn’t walk by without stopping to admire the colors of summertime! 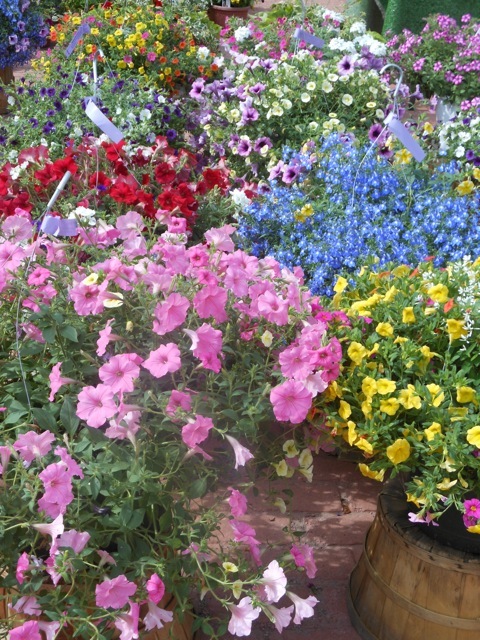 These hanging baskets were filled with showy annuals in lovely combinations. Painted furniture of all kinds filled the park that morning. A chippy door supported this repurposed piece of furniture. 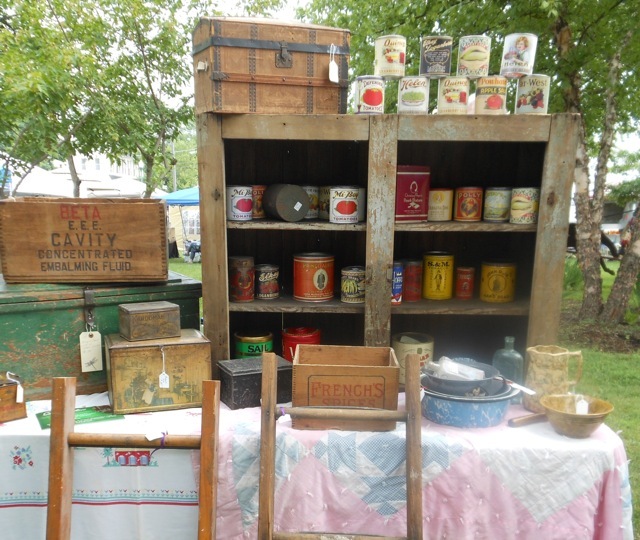 I love looking at all of the vintage tins and wooden boxes. 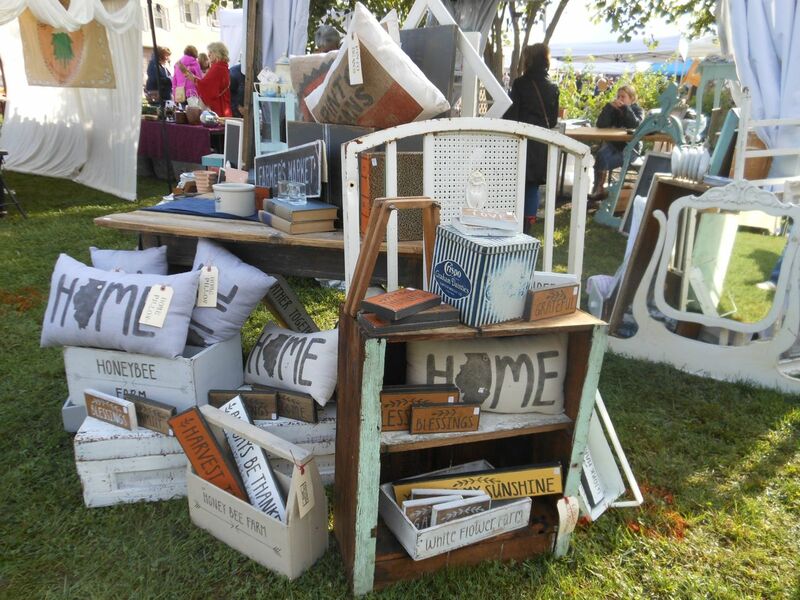 Vintage wares fill a primitive shelf and a quilt-covered table. on a hot, June day in the Midwest. 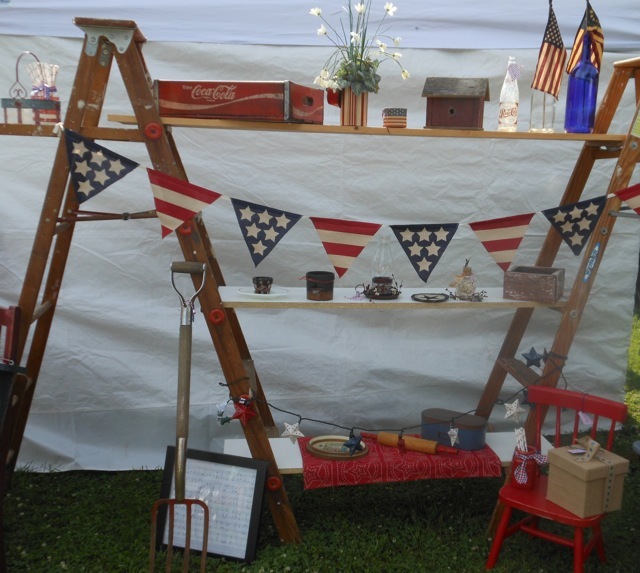 Here are just a few of the patriotic displays that caught my eye. After looking at all of the displays, I walked back to buy what I had come in search of that morning. I bought a vintage, enamelware colander. It’s exactly what I need for a special project! Can you guess how I will use this old colander? My husband was happy to find some old Greek drachma coins. He made a very unexpected discovery that morning, too! He took a walk down the wooded path (while I took one more walk past the vintage treasures). Right there, in the middle of the path, he spotted two very large hens meandering ahead of him! Perhaps they were on their way to the French Country Market, too! It certainly was a good morning to hunt for treasures! 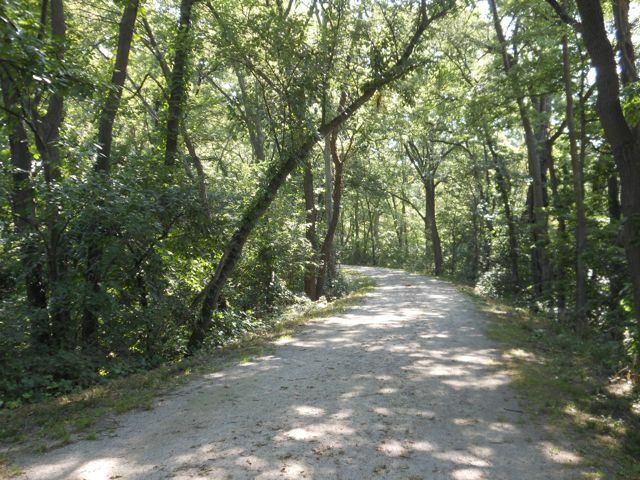 The shady, wooded path along the I&M Canal was cool and welcoming on a hot, sticky morning. It was time to explore the path along the peaceful canal. 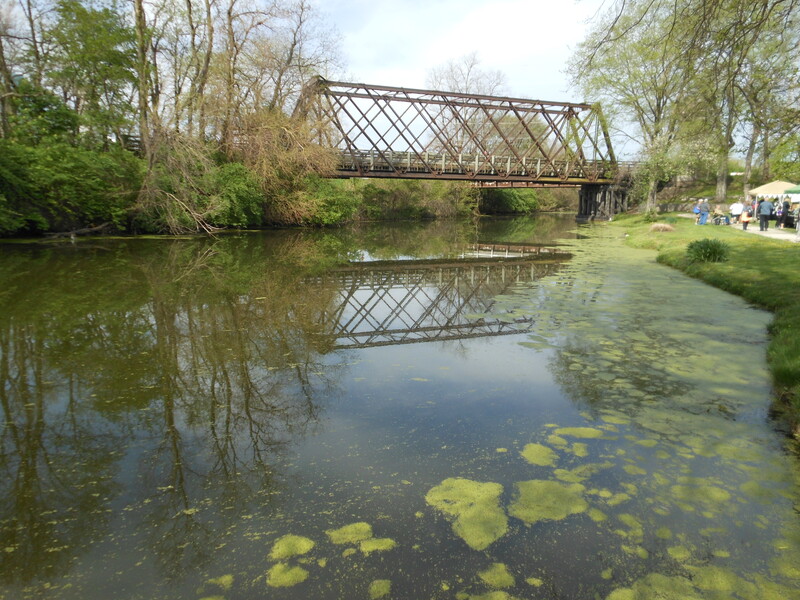 The I&M Canal, in Morris, has an important history. 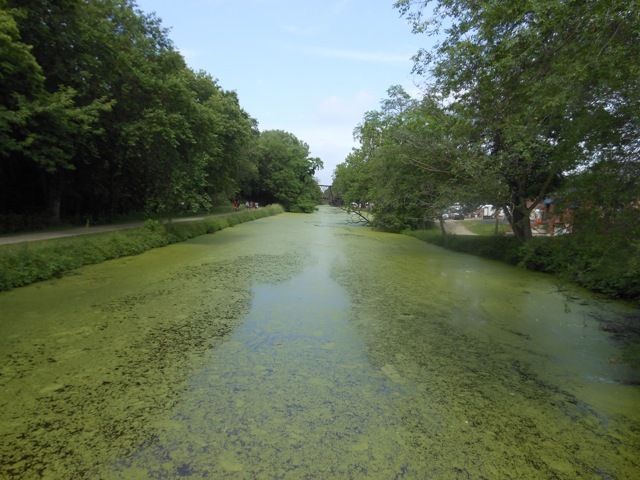 While today this sleepy canal is a quiet, peaceful place, for many years it was the busy 96-mile long Illinois & Michigan Canal. Irish immigrants, working under very dangerous conditions, dug the canal by hand from 1836 to 1848 to create a water highway. Water was pumped into the canal from rivers in the area. Towpaths were constructed on both sides of the canal to allow mules to walk along and pull barges through the canal. The I&M Canal helped to connect the The Great Lakes to the Mississippi River and on to the Gulf of Mexico. This made Chicago a great inland shipping port and helped agriculture flourish in Illinois. 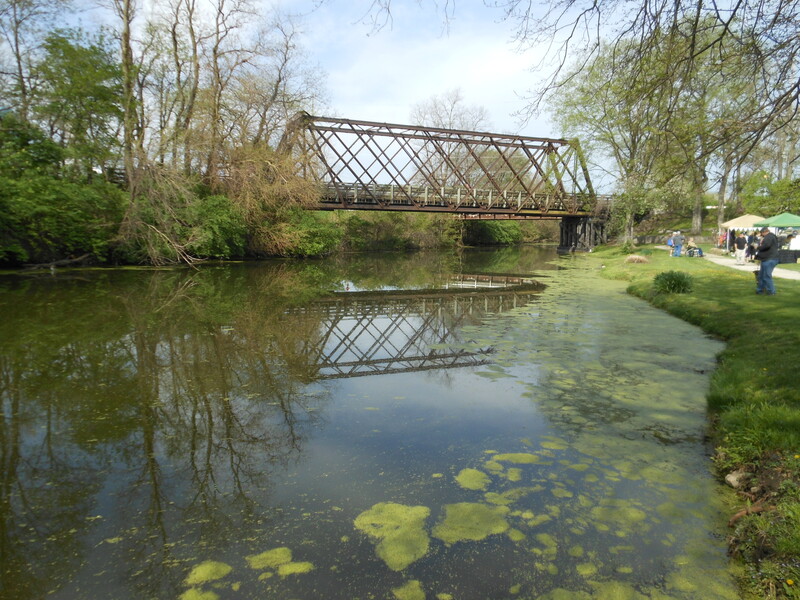 Later replaced by larger man-made waterways, railroad tracks, and highways, the I & M Canal closed in 1933. Although much of the canal has been filled in, portions of the canal have been preserved in this historic corridor. 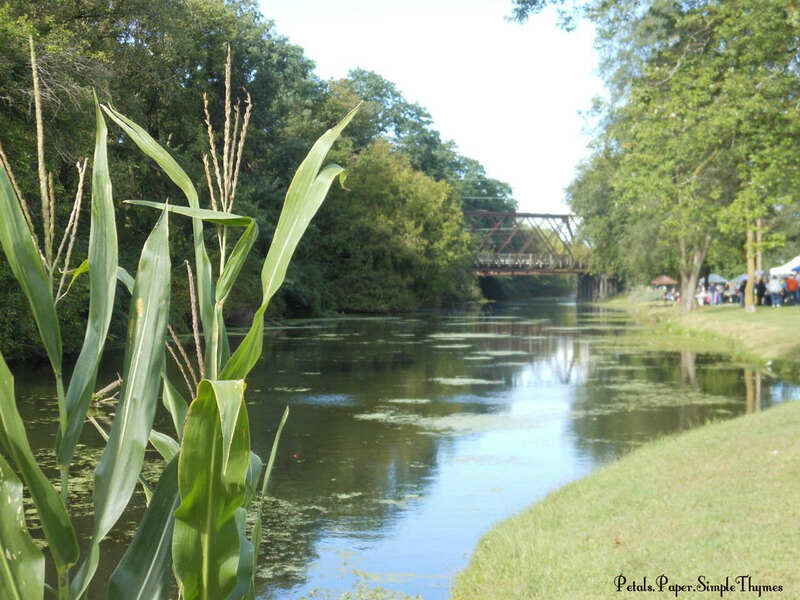 Today footbridges and the walking path along the canal remind us of the canal’s long history. We walked beyond the canal to see the fast-moving water of the nearby Illinois River. Recent heavy rains have made the river swell beyond its banks. 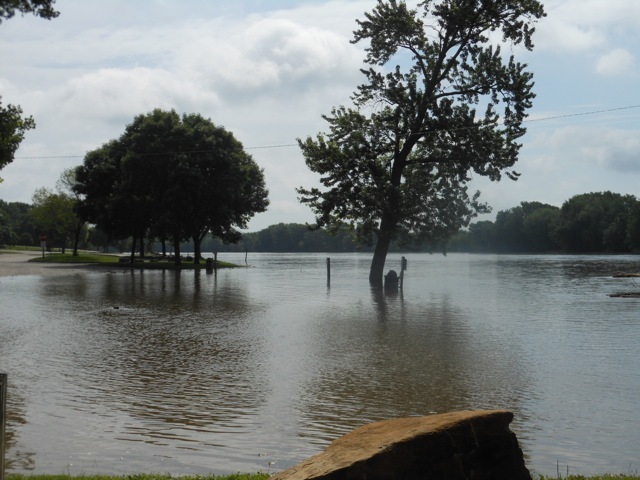 Trees surrounded by water showed the flooding conditions on Saturday morning. The Illinois River, at Morris, overflowed its banks engulfing trees in its raging water. We walked through downtown Morris exploring the shops and had a picnic lunch nearby. Then it was time for the next part of our adventure. We drove to the small town of Wilmington, on historic Route 66, to visit a big antique mall. 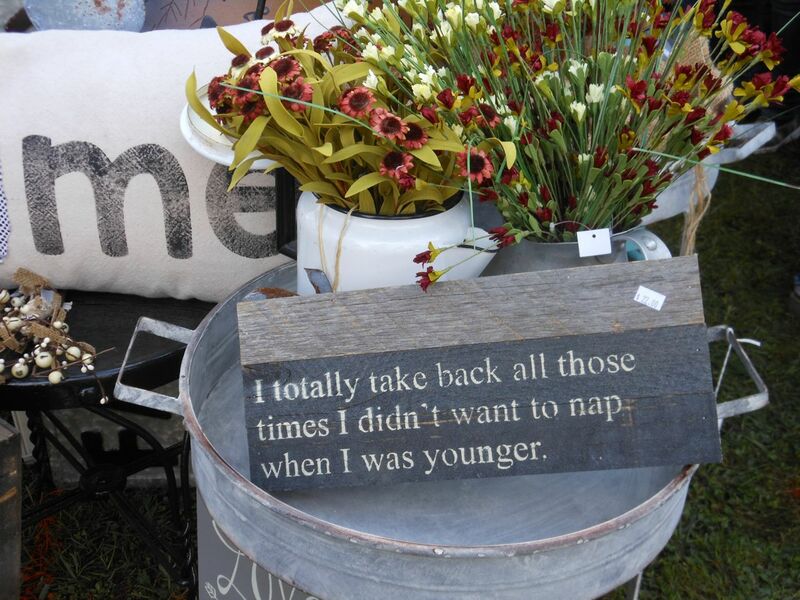 As we wandered amongst the antiques and vintage treasures, we saw so many memories of our childhood. 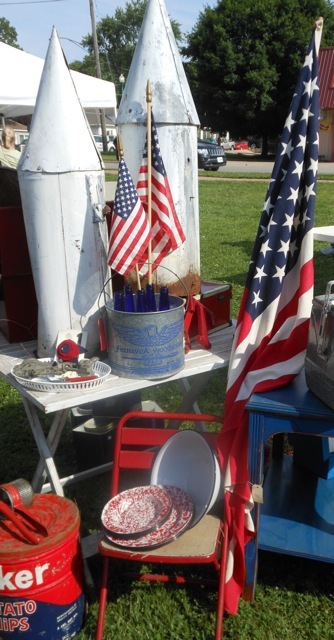 Have you noticed that your childhood toys and family housewares now fill the antique malls? We have become very trendy ~ Mid-Century Modern! Dark, threatening skies overhead soon told us that it was time to end our adventure and head for home. Saturday evening, rainstorms brought over 5 more inches of rain to the Morris area! Flooding along Illinois River has grown much worse since our visit yesterday. We are thinking of the people living in all of the small towns along the swollen rivers. I really wish we could send them some dry, sunny days! Hope you enjoyed a nice weekend filled with some of your favorite activities! I’m looking forward to another busy week in the garden, in between the rainstorms. Can’t wait to get started on a fun project using a vintage colander!! Brrrrrr! It was such a chilly Saturday morning! Just after sunrise, we drove through the countryside to the quaint, little town of Morris, Illinois, ‘leaf peeping’ along the way. It was time for the final 3 French Hens French Country Market of the season. 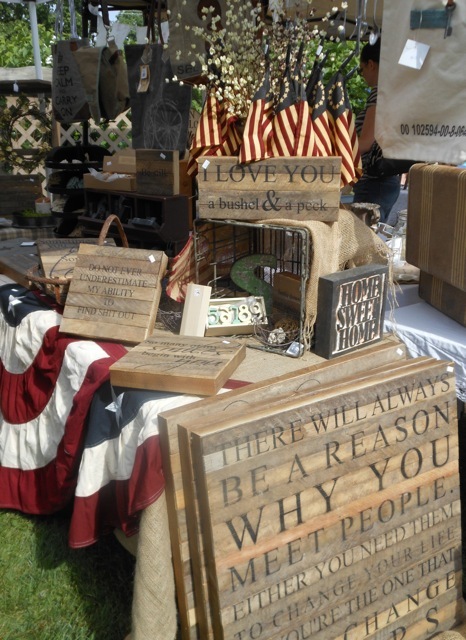 This popular event is held on the second Saturday of each month, from May through October, in Canalport Park along the banks of the historic I & M Canal. 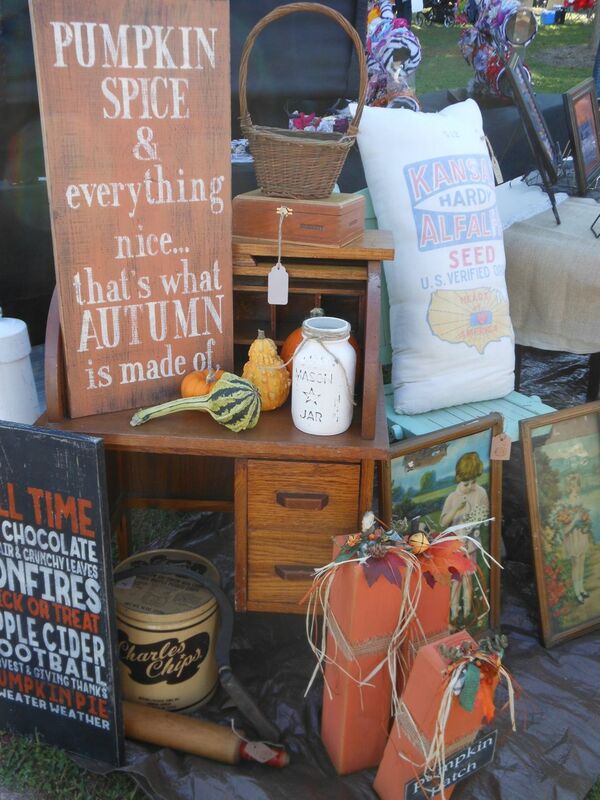 It’s always one of our favorite antiquing destinations! 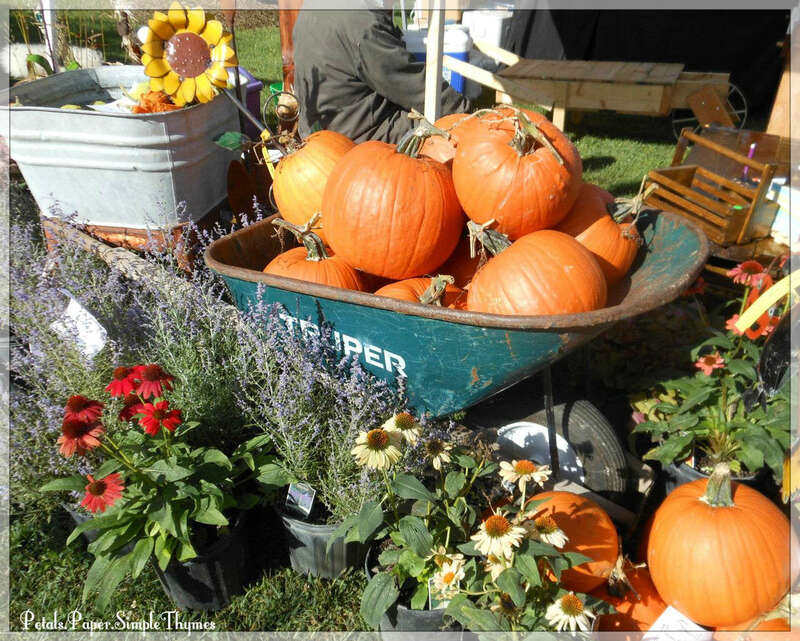 The 3 French Hens French Country Market attracts the friendliest people ~ antique dealers, artisans offering their handmade wares, gardeners selling colorful Chrysanthemums, bakers displaying their delectable treats, local farmers selling freshly-picked produce, and treasure hunters galore! 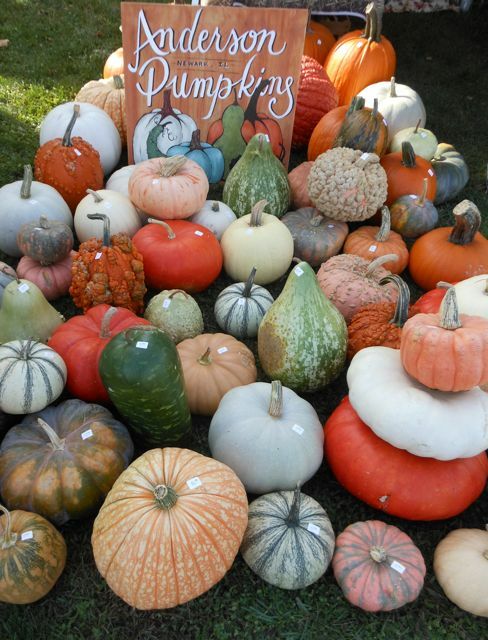 One of the delights of the October market is… pumpkins!! We had such fun talking with the grower of Anderson Pumpkins. 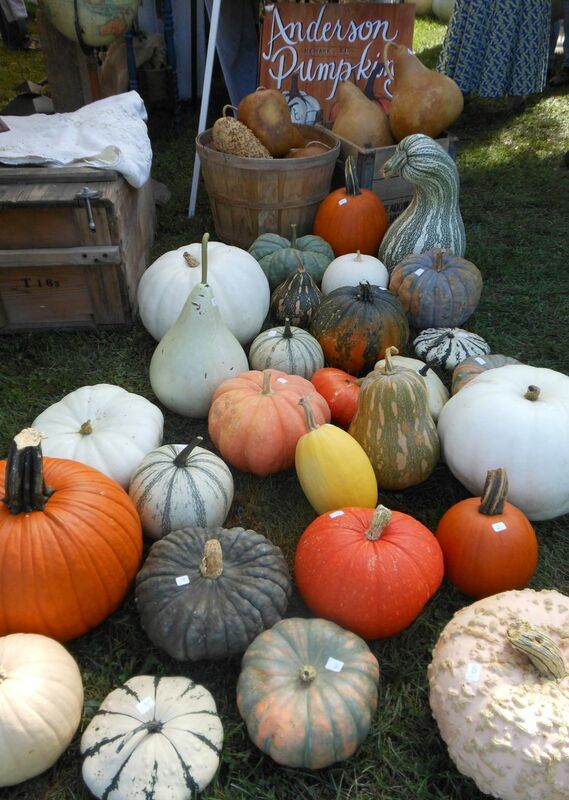 Valerie shared tales of the pumpkins and gourds they grow on their farm. Each variety has a wonderfully descriptive name. 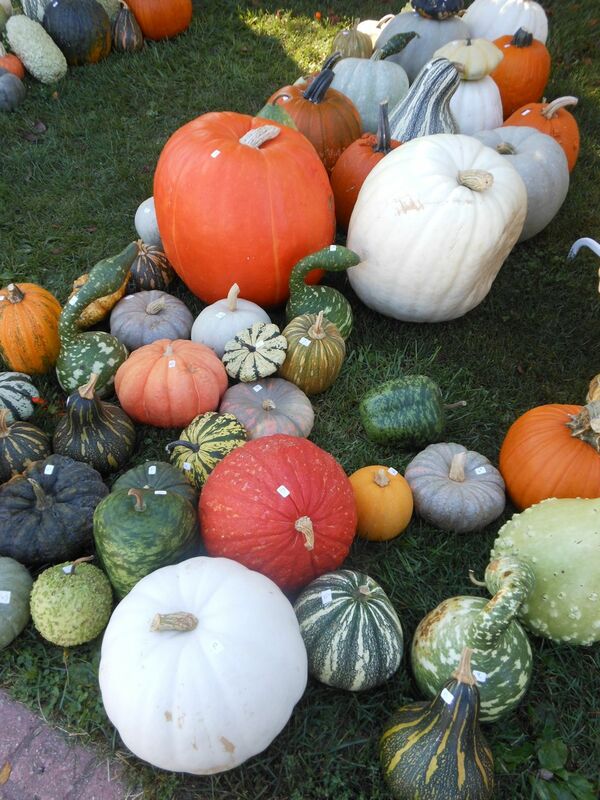 Just imagine the fun of naming each variety of pumpkin! 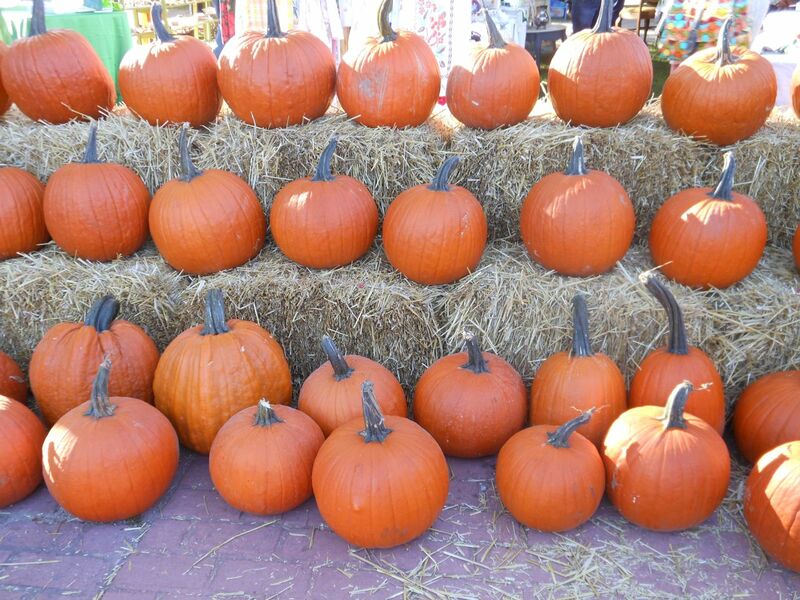 Anderson Pumpkins, in Newark, Illinois, grows more than 50 varieties of pumpkins, squash, and gourds! Rather than carry a heavy pumpkin through the market, we picked out a variety of small, unique gourds to fill a basket on our dining room table. 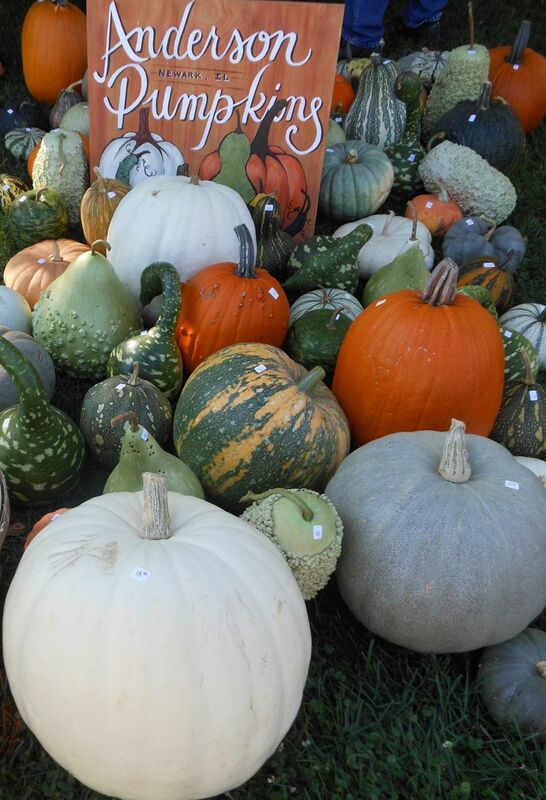 Passersby smiled as they watched us picking out several ‘perfect’ gourds to take home! 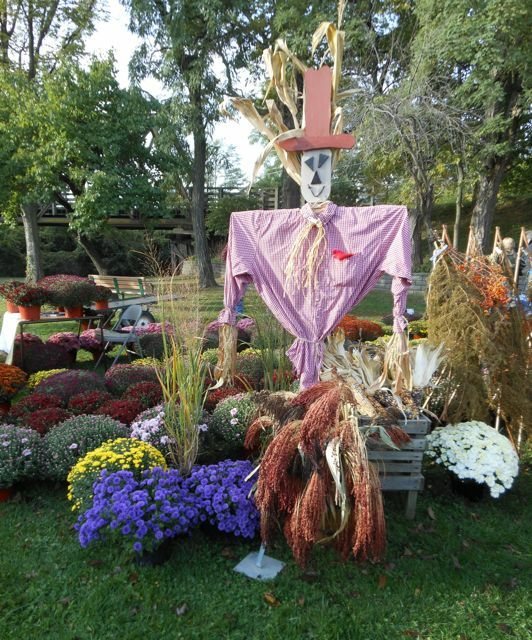 Scarecrows are popping up all over the Midwest this month. We stopped to enjoy scarecrows of all sizes and shapes. 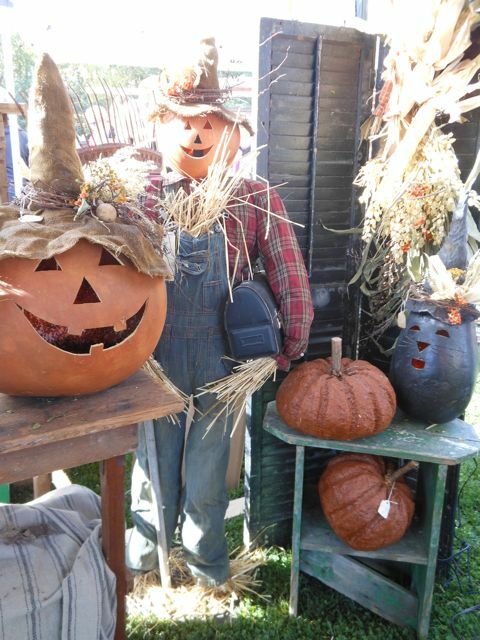 Although we haven’t made our scarecrow yet this Autumn, we found so much wonderful inspiration here on Saturday morning! 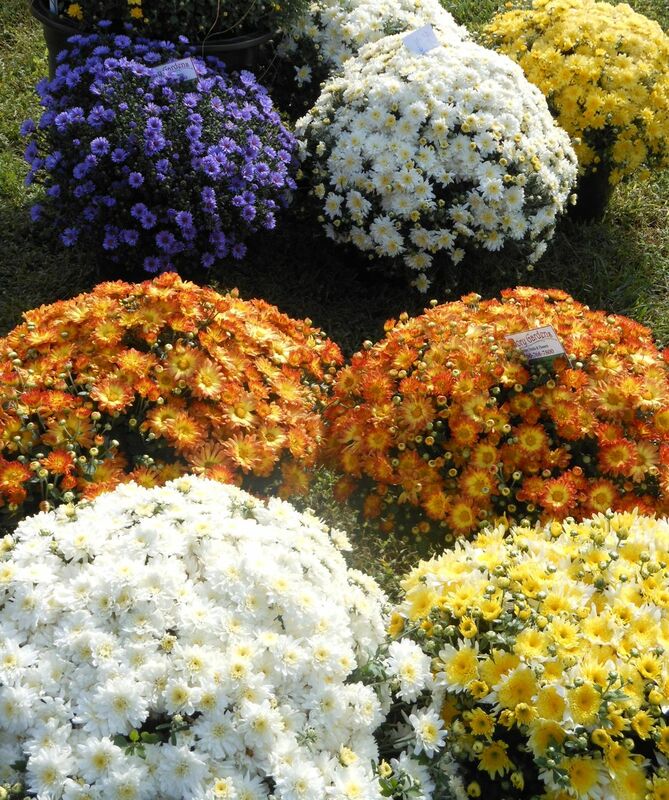 A friendly scarecrow stands watch over a garden of colorful Chrysanthemums. 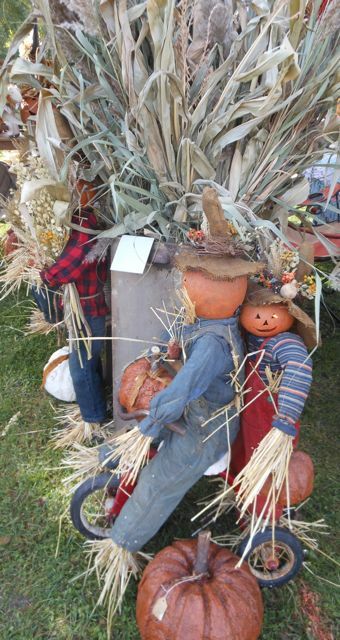 Kathy Pribble wil be selling her delightful scarecrows again next weekend, at the 3rd Sunday Market, in Bloomington, Illinois. With cups of steaming, hot pumpkin spiced tea and hot apple cider to chase away the early morning chill, we continued our treasure hunting. There was so much more to see! 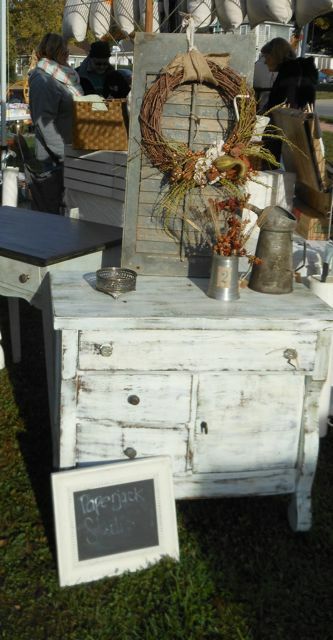 ‘Dave and Jayne’s Furniture Fix‘, from Wilmington, Illinois, offered pretty painted and distressed furniture. 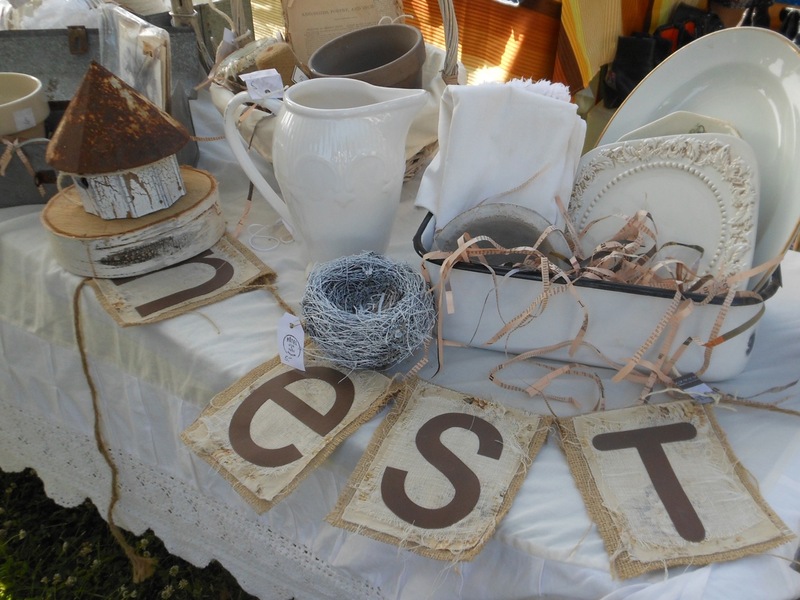 Caroline, from Paperjack Studio, offered her repurposed furniture, vintage finds, and painted letters. What a perfect Saturday morning! The friendly people always make the 3 French Hens French Country Market extra special. We had nice long visits with a soap maker, a pumpkin grower, and a baker. It’s wonderful to find so many talented people from so many walks of life gathered together in a pretty park in the heartland. As we walked through Morris on our way to the car, we listened to the crunch of leaves underfoot. 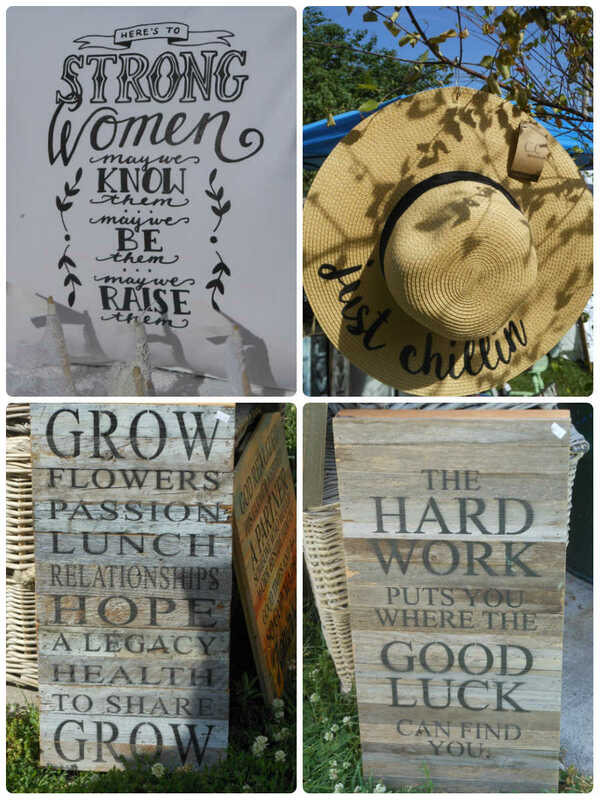 We were filled with inspiration and happy memories of a lovely morning of treasure hunting. We brought home some small treasures that hold big memories ~ a bag of unique gourds, fragrant bars of handmade Lemongrass/Mint Goat Milk soap, and shiny, silver charms to add to a necklace. The best memories of all weren’t carried in our bags ~ they are carried in our hearts! Warm memories that will last through the cold winter months ahead. Next weekend, there will be more ‘leaf peeping.’ Yellows, oranges, and brilliant reds are just beginning to show their colors here. The green leaves will soon perform a spectacular symphony of Autumn colors. The following weekend, there is sure to be another popular Autumn activity… leaf raking! 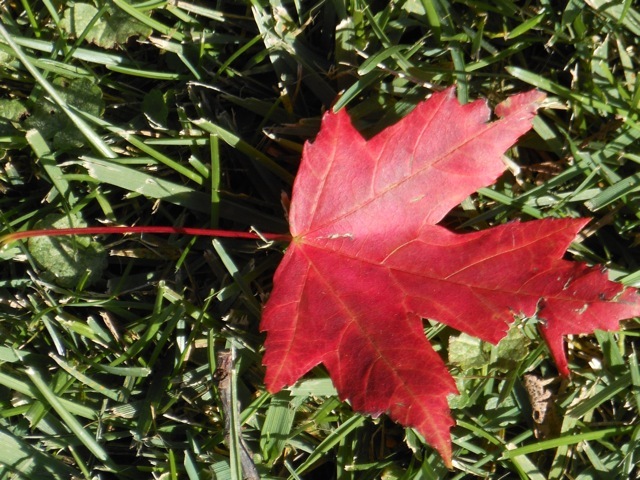 A few leaves from our ‘Autumn Blaze’ Red Maple have begun twirling down. 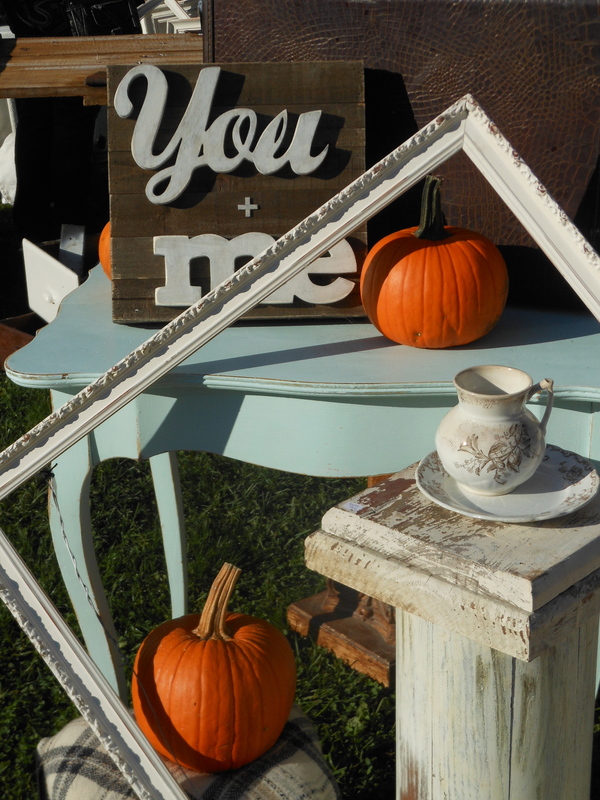 Autumn is the perfect time for making memories! P.S. 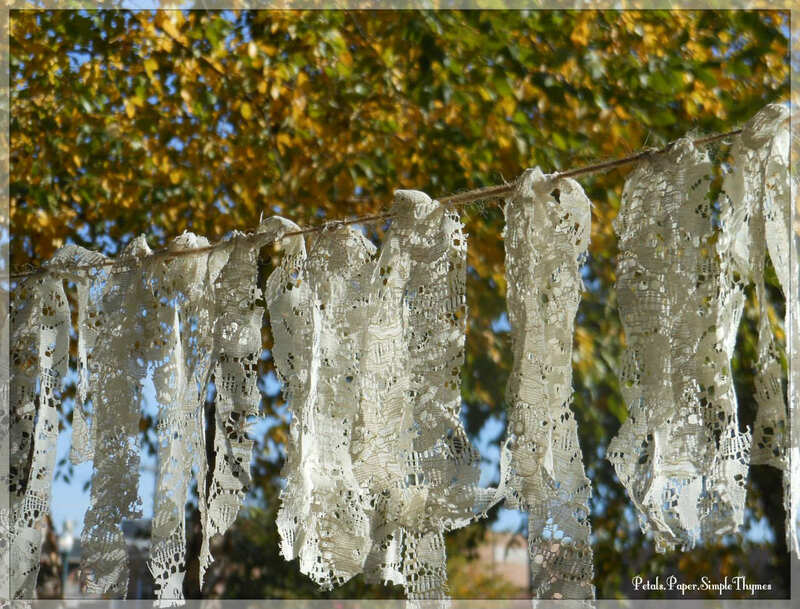 What are your favorite Autumn activities? We hit the road very early on Saturday morning! 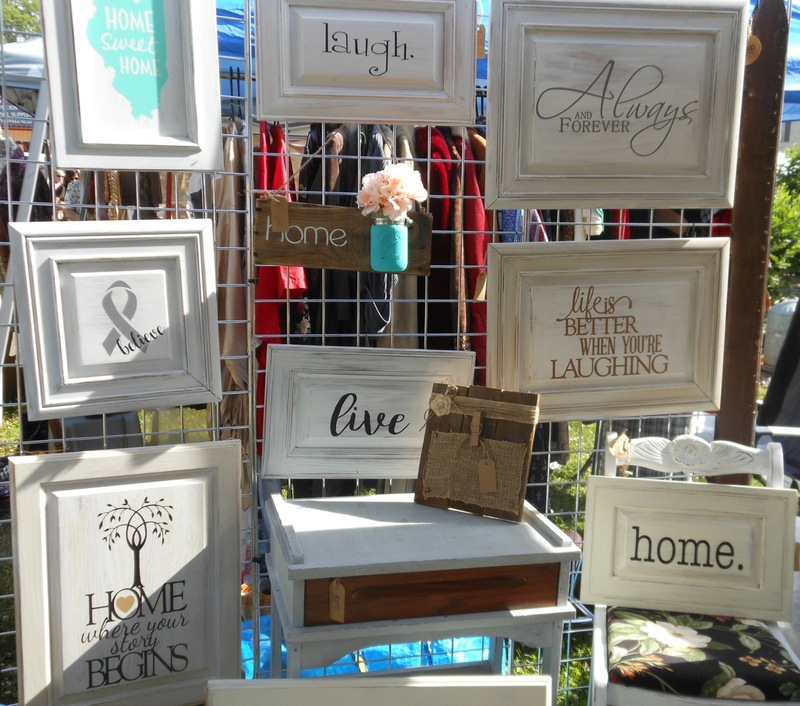 My excitement just bubbled over, as I wondered what treasures were waiting to be discovered at the 3 French Hens French Country Market. 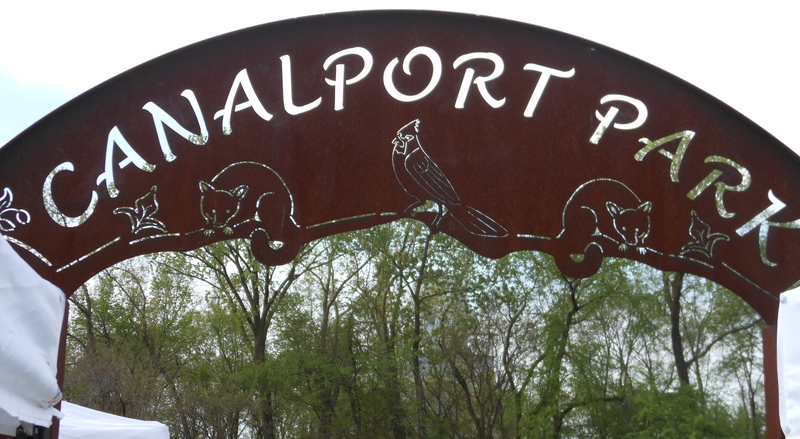 This monthly market, located in the quiet, little town of Morris, Illinois, completely fills a pretty park, on the banks of the historic I&M Canal. The 3 French Hens French Country Market is held on the second Saturday of the the month, May through October. It’s good to arrive early, as the little town quickly fills with visitors! 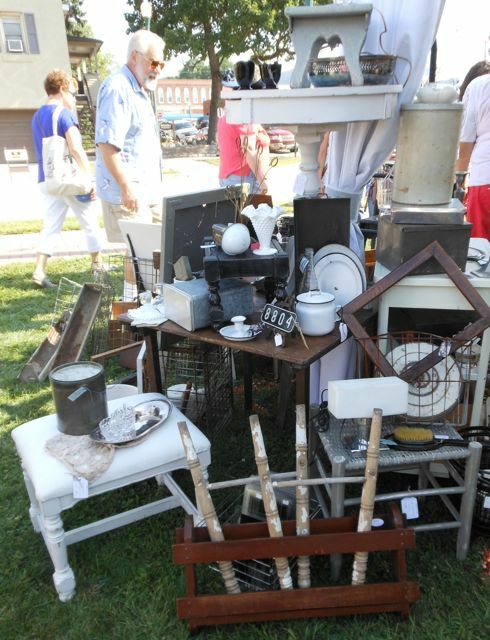 Everyone is headed to Canalport Park in search of antiques, handmade wares by talented artisans, and repurposed treasures. We’ve been going for the past three years. It’s always a delightful place to spend the day, in the Spring, Summer, or Fall. This pretty park sits along the peaceful waterway. 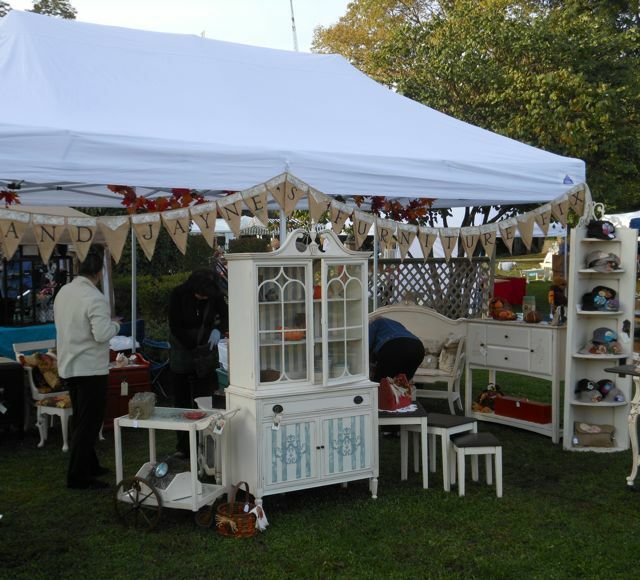 Antique dealers and talented artisans display their wares in the park along the sleepy canal. if I have one or two treasures on my ‘wish list’ for the day. Don’t you find it easier to know what you are searching for? It was such fun to look at everything! Treasures upon treasures, all waiting for new homes. 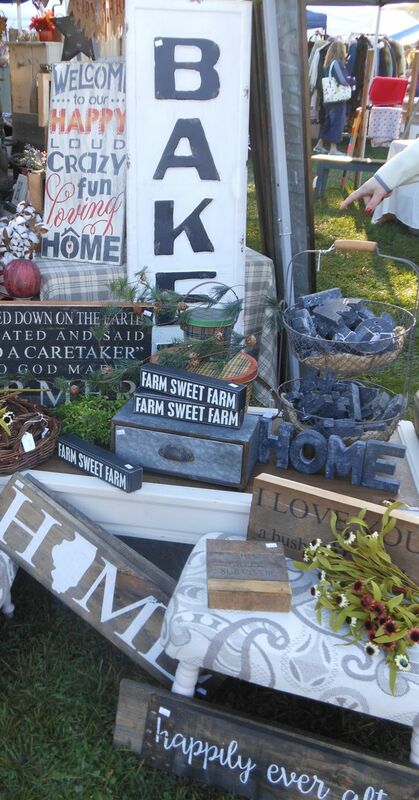 Olde Farm Creek offered a nice collection of vintage inspired farmhouse treasures. It was fascinating to talk with the artisans about their handmade pieces. 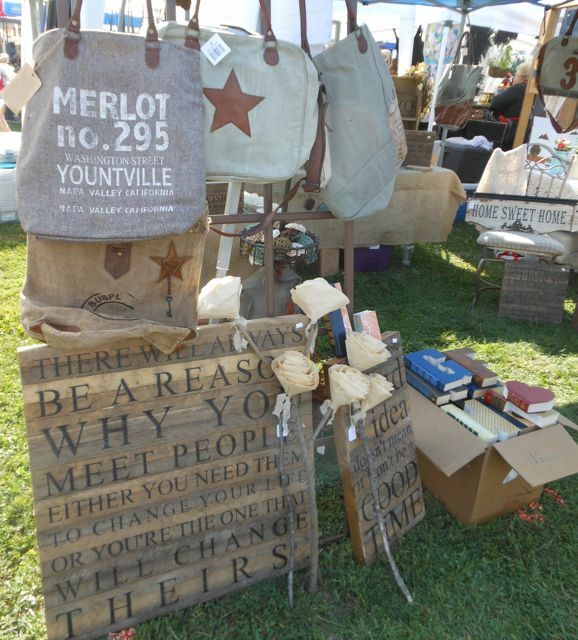 These primitive signs were made from tobacco lath and the beautiful canvas bags were stitched from worn tent canvas. 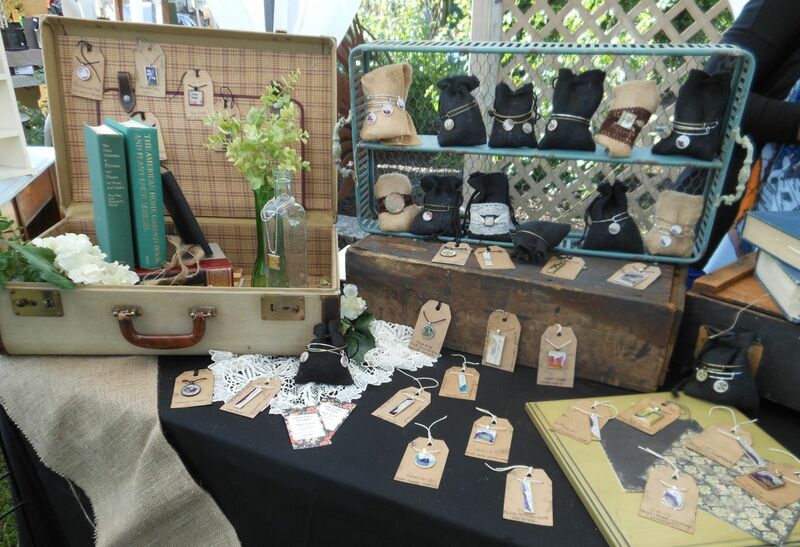 The lovely, old patina of the materials added a special touch of the past to each newly created piece. 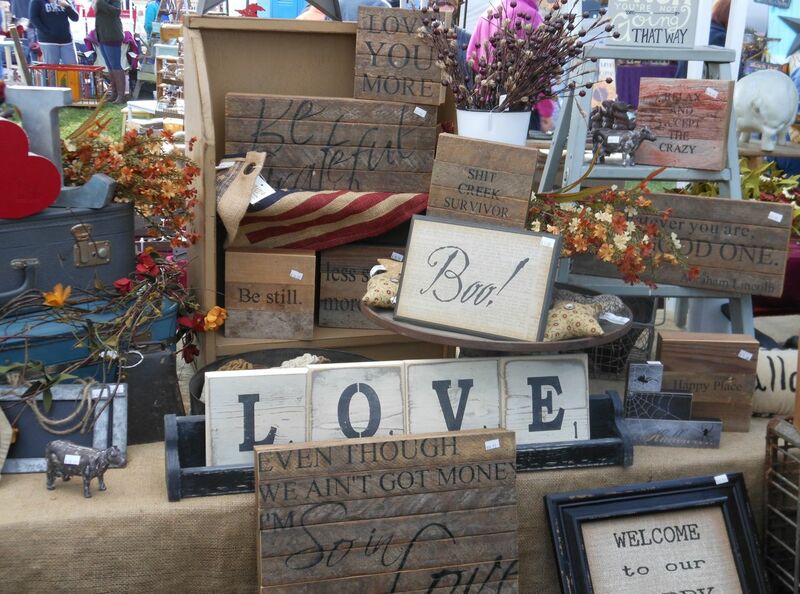 Roseberry Farm Primitives brought a touch of Autumn to the market. 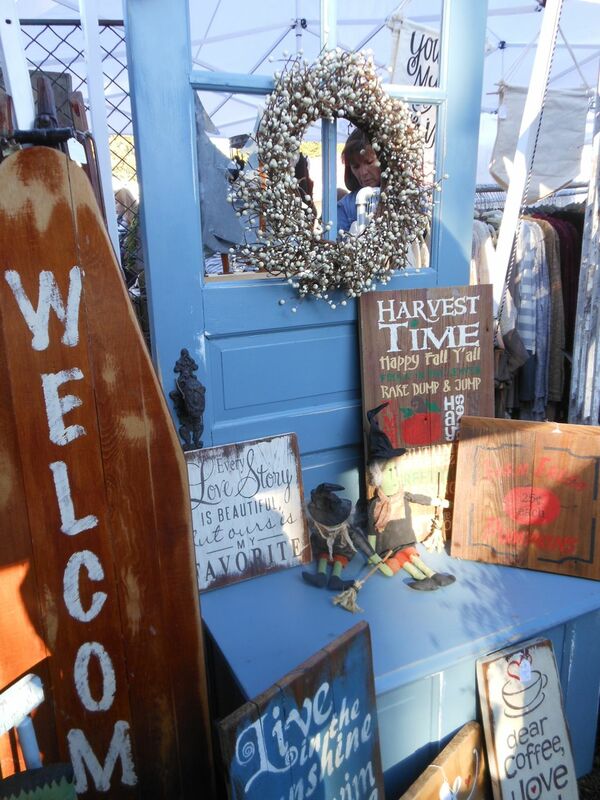 The 3 French Hens French Country Market always draws big crowds of the friendliest people! Live acoustic music drifts across the park. Wonderful smokey smells from the food vendors whet the appetite for a picnic lunch. But it was much too early… and there was still so much to see! 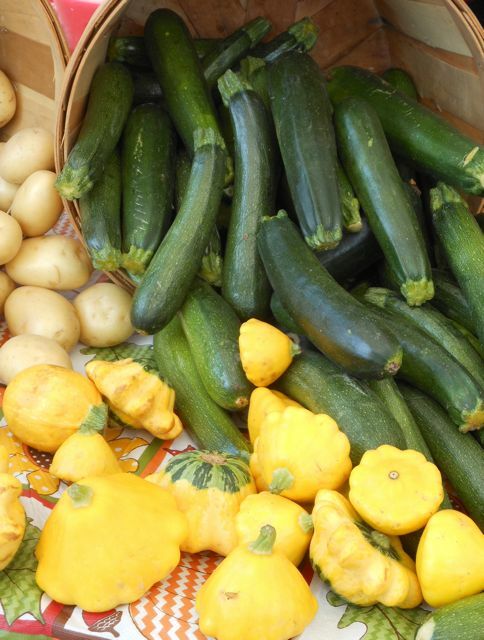 Local farmers bring their fresh-picked vegetables and fruits to the market. Bakers bring homemade pies, breads, and cookies. Freshly canned jams, marmalades, and salsas make it easy to take home the tastes of summertime to enjoy throughout the year. My husband and I continued exploring, looking through all of the treasures of the past, and laughing as we came upon so many toys from our childhood. He is always attracted to vintage books, old photographs, and antique coins. I’m always drawn to peek inside old painted cupboards, to touch antique quilts in soft colors, and to admire vintage Mason jars sparkling in the sunshine. It was a perfect way to spend an August morning! Suddenly, I saw it! I discovered what I had been looking for all morning… inspiration!! My heart just leapt when I saw the beautiful antique school desk! 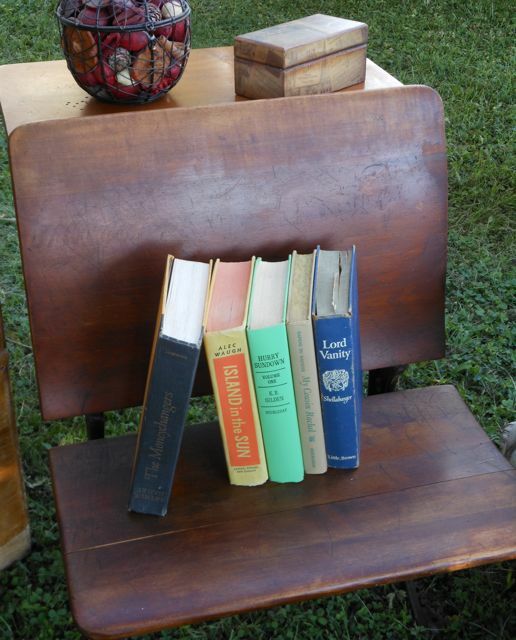 It looked so nice displaying old books on its seat and vintage treasures on its desktop. It was just the right inspiration… at the right moment! Jessica, from Tattered Accents Old & New, and I talked about so many different ways to use an antique school desk. Many years ago, a friend gave me an antique school desk. I’ve been saving it in our basement, thinking that one day it might look nice in the garden holding baskets of summertime flowers, or on the front porch holding vintage boxes filled with winter evergreens, pinecones, and holly. But today there is new inspiration! Maybe it’s time to bring the old desk upstairs to hold some vintage school memories. It’s such a great feeling to discover new inspiration for a treasure that you have loved all along! Truly a perfect August morning! who share the gift of learning every day in their classrooms! You truly do make a difference! Here’s to a happy new school year… and all its promises! we honor and thank you for making our world a brighter place! P.S. What is your favorite back-to-school memory? 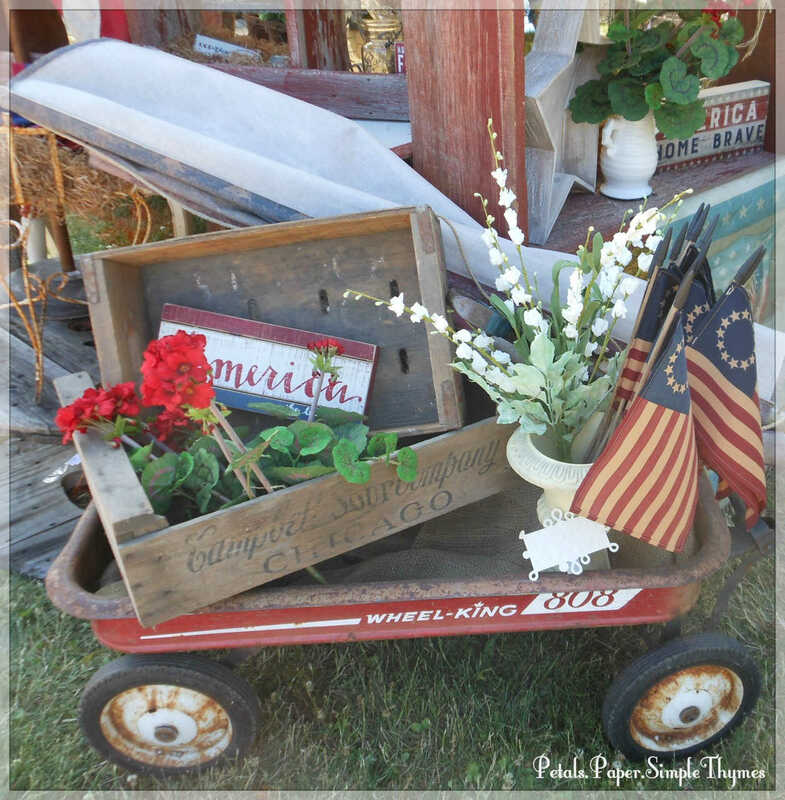 There were just two antiques on my wish list this weekend ~ a small metal flower frog (to hold a handmade card as I photograph it) and a small table for our front porch (just big enough to hold a crock of garden flowers and a glass of iced tea). I knew it would take some searching! Would these timeworn treasures be there waiting to be discovered? 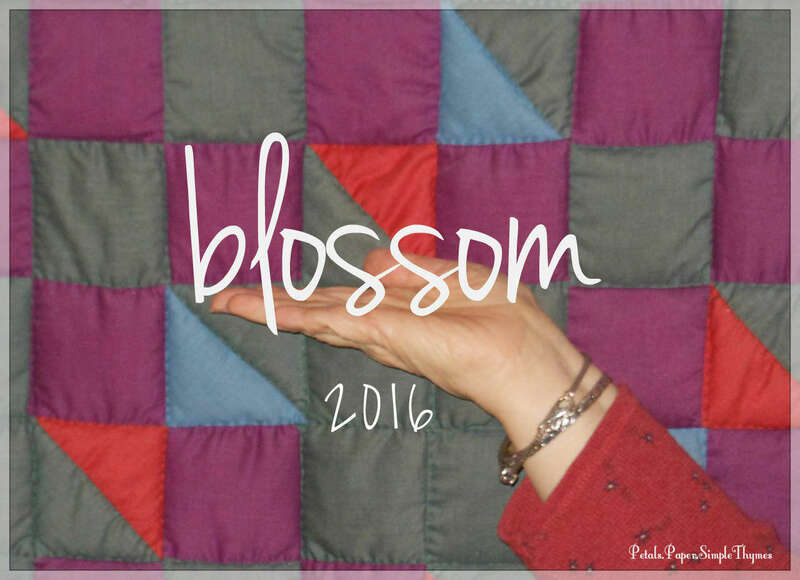 We knew where we could search… and I was so excited! We left very early on Saturday morning and drove through beautiful farm country to the quaint, little town of Morris, Illinois. 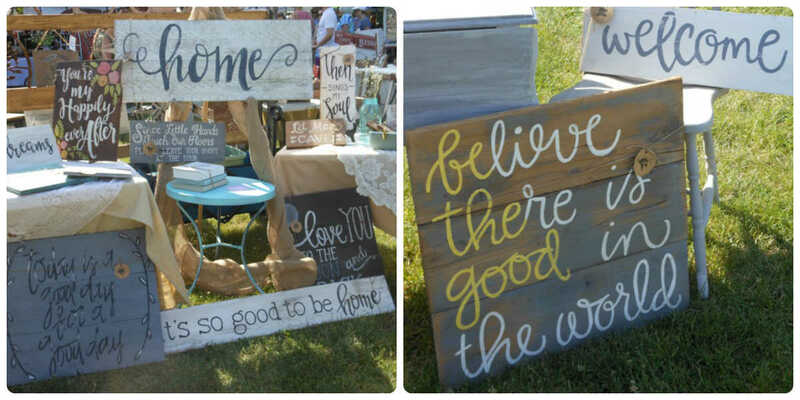 It was time for the 3 French Hens French Country Market. 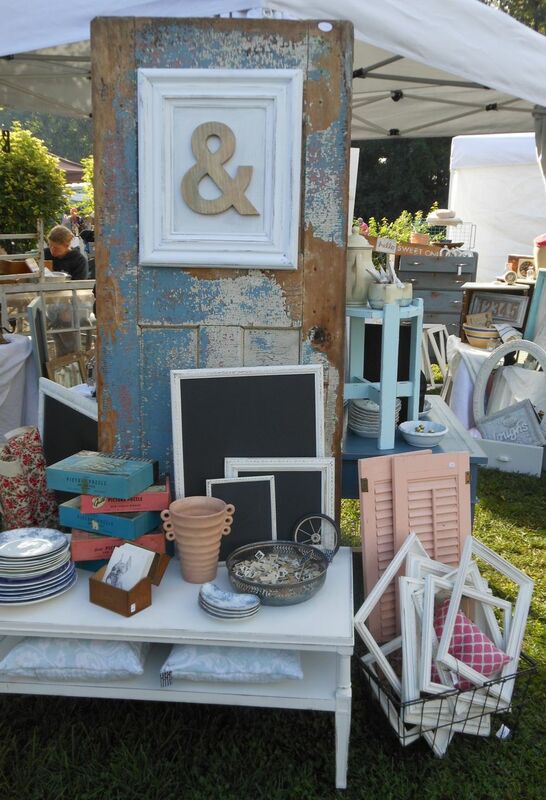 It’s always a fun-filled day, enjoying antiques, handmade wares by talented artisans, repurposed treasures, flower markets, live acoustic music, tempting homemade foods, and the friendliest people anywhere! A wonderful place to find treasures! 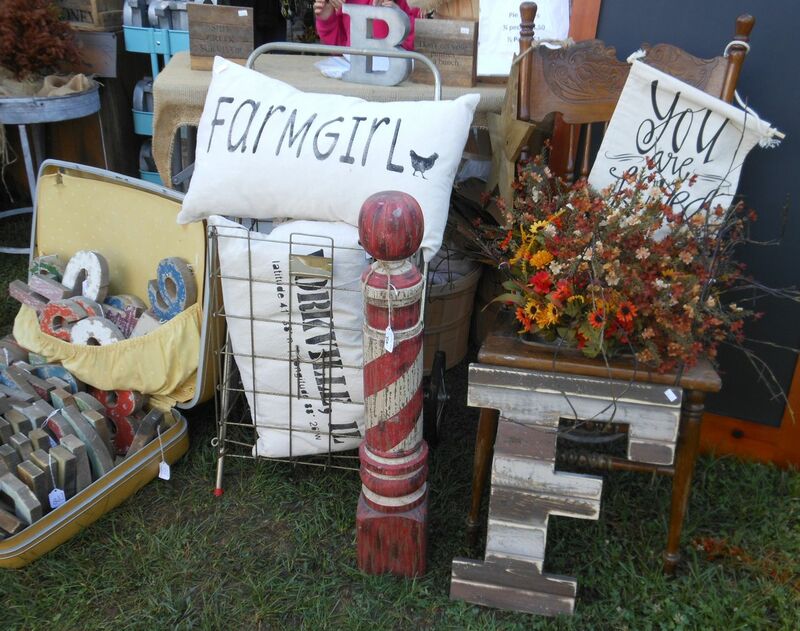 The 3 French Hens French Country Market is one of the top-rated antique markets in the Midwest. The 3 French Hens French Country Market is held on the second Saturday of the the month, May through October. It’s good to arrive early, as the little town quickly fills with visitors! 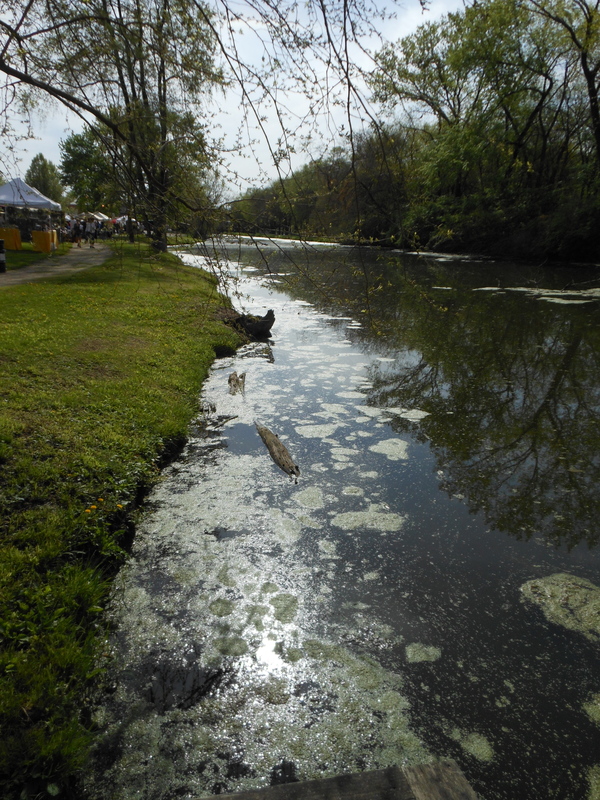 Everyone is headed to Canalport Park, on the banks of the historic I&M Canal. We’ve been going for the past three years. 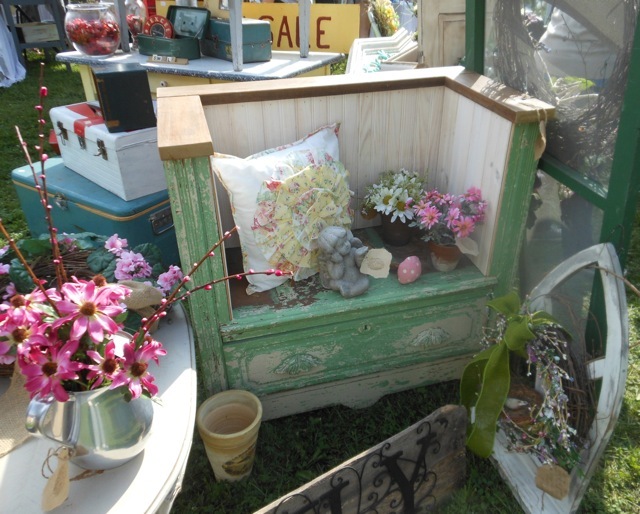 It’s always a delightful place to spend the day antiquing, in the Spring, Summer, or Fall. This pretty park sits along the the peaceful waterway. The footbridge is part of a shady walking trail. 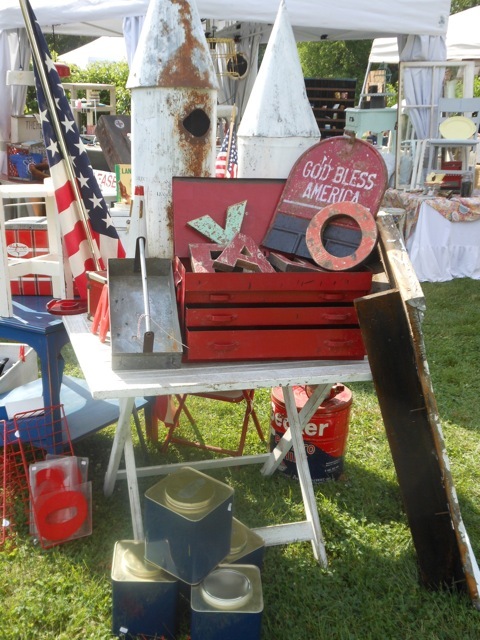 Antique tables, toolboxes, baskets and a beautiful trunk. Treasures from the past filled with charm! Or… do you like the black one better? We stopped to help a friendly shopper decide. I think she was very lucky to buy either piece! Repurposed planters made pretty container gardens. Flowers galore, just in time for our Spring gardens! 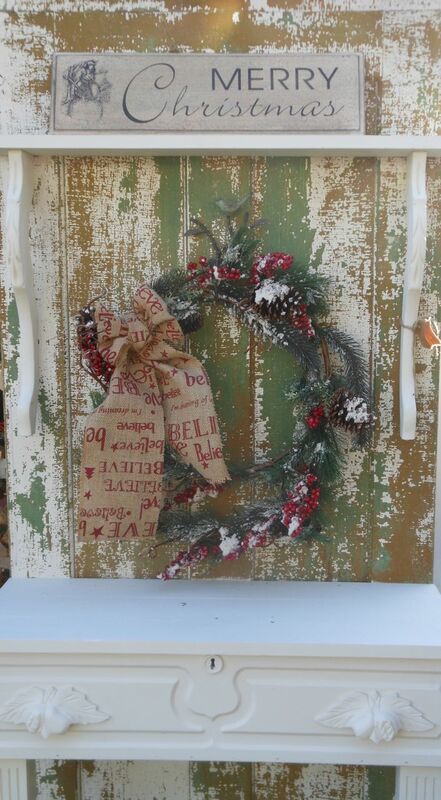 Delightful for a front porch! 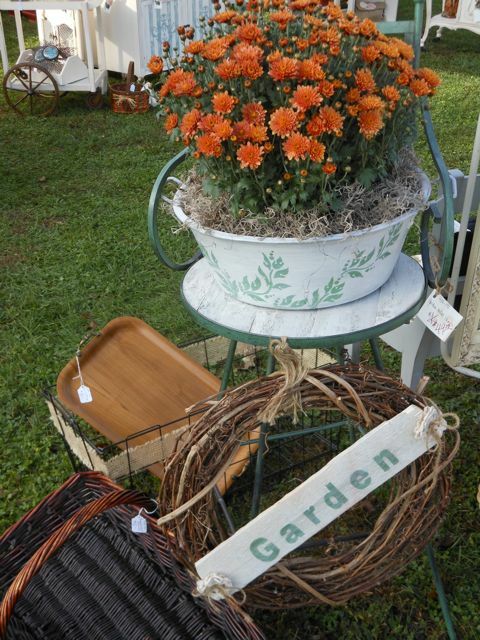 Vintage plates add a special touch to this flower basket. It was definitely a perfect Spring day to hunt for treasures! Talented musicians added the perfect accompaniment to our morning. Beautiful crabapple trees throughout the park added a festive touch of Springtime! What a wonderful morning filled with inspiration! 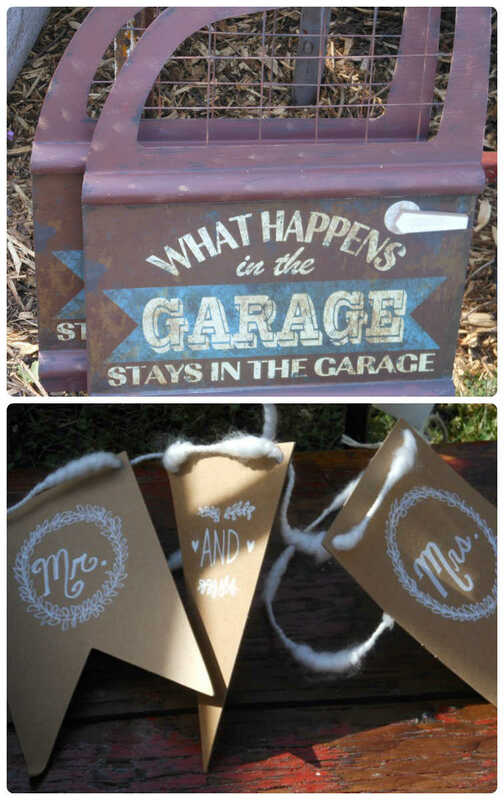 I came home with so many creative ideas to add a bit of vintage charm to our garden, front porch, and deck. The timing couldn’t be more perfect! It’s time to plant our Spring containers and turn the front porch into our Summer living room. Oh, remember the two antiques on my wish list? Halfway through the French Country Market, I found an old metal flower frog that will hold a handmade card just perfectly. A bit later, I realized that I had made a big mistake by passing up the cutest pair of floral garden boots! 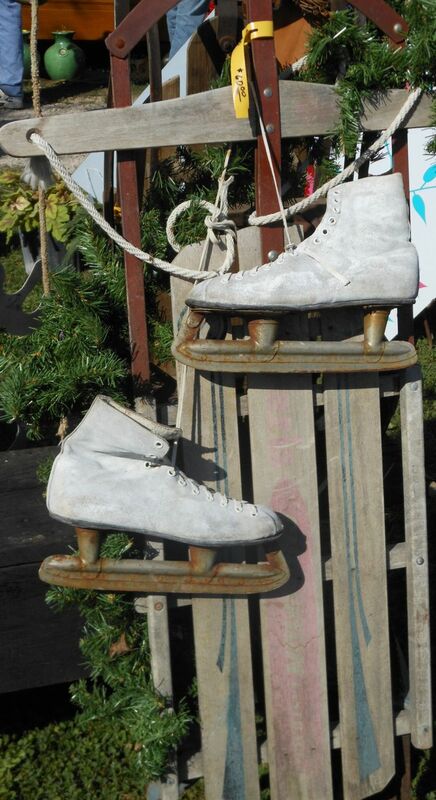 They weren’t even my size, but they were perfect to stand by a big pot of flowers on the front porch. My sweet husband went back to find them. Imagine what the lady thought as he came to buy flowery garden boots! She smiled as he explained that his wife really needed these boots! Happily, my husband found a special treasure of his own ~ a very old Greek drachma coin. Treasures come in all sizes! As I was walking back to our meeting place, guess what I spotted? 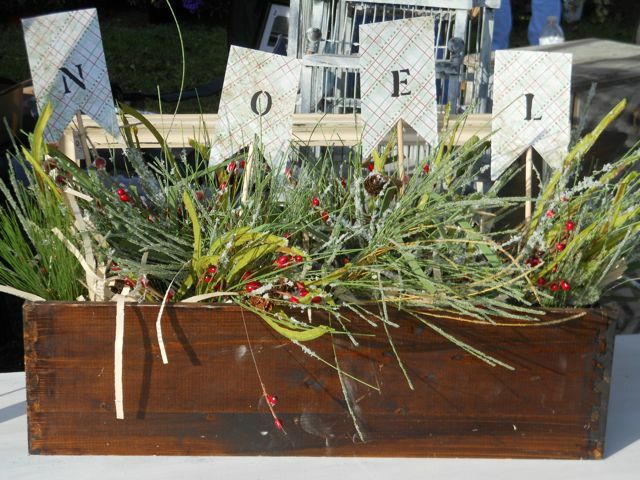 There it was… a shabby, white table just large enough to hold a crock of garden flowers and a glass of iced tea! It was a perfect ending to a perfect day! P.S. What treasure have you been searching for? We’ll all keep our eyes open… Maybe we can find it!